Wohlsen Construction Company and RGI/MidAtlantic Endoscopy celebrated the commencement of the relocation project for their new surgery center. The project includes the demolition of an existing medical office suite and construction for the new center located in Penn Medicine Lancaster General Health’s Suburban Pavilion. 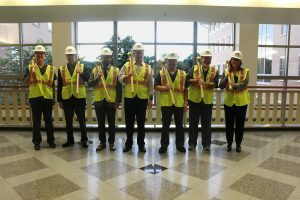 As a unique twist on the conventional groundbreaking ceremony, the team held a wall breaking ceremony, where doctors and staff suited up in protective equipment and took the first swings in the demolition process. The new location is slated for completion in mid-2019. For nearly 40 years, RGI/MidAtlantic Endoscopy has been providing high quality care for patients in need of digestive care in South Central Pennsylvania. Two established practices, LGI and RGAL, recently merged to form RGI and MidAtlantic Endoscopy. The 25 board certified RGI physicians specialize in colorectal cancer screening and the treatment of diseases involving the digestive tract and are glad to help with all of your digestive needs. Whether you are having gastrointestinal (GI) symptoms such as abdominal pain, GI bleeding or you need a screening colonoscopy to prevent colon cancer, RGI/MidAtlantic Endoscopy is dedicated to caring for the community, believing in face-to-face, compassionate medicine, where patients feel reassured and unrushed. For more information and to learn about their other location in Ephrata, visit www.MidAtlanticEndoscopyCenter.com.